Last year, Janelle Criscione celebrated her 66th birthday on a white-water rafting trip along the Snake River in Idaho and Oregon. Along the way, she camped and hiked in rugged Hells Canyon, North America’s deepest river gorge. She also chopped vegetables and sampled wine. Ms. Criscione, a retired nurse who lives in St. Louis, is a big outdoor enthusiast; for her birthday the year before, she’d gone climbing in the Teton Mountains in Wyoming. What she is not is a particularly experienced or ambitious cook. Friends of Ms. Criscione had gone on white-water trips with the organizers of this one, which was going to center around food. When they told her about it, she was interested. “Then I found out they might make us cook,” she said with a laugh. The trip Ms. Criscione took was the inaugural voyage of ROW Adventures’ Culinary Whitewater Series, in which participants can raft Class III and IV rapids on the Snake or Salmon Rivers in Idaho, or the Grande Ronde River in northeast Oregon. But the distinguishing attraction is the opportunity to cook up fancy fare the old-fashioned way, on the trail with not much more than a Dutch oven. Lest you dismiss this as lowly camp grub, we’re talking wild salmon and Pacific oysters, all paired with Pacific Northwest wines, and carefully packed by the guides. And ROW Adventures is not alone. An increasing number of outfits are following this model, offering a dose of culinary-oriented instruction along with outdoor adventure — a kind of “cooking school goes wild” for those with interests both active and gourmet. Peter Grubb, president and founder of ROW Adventures, said the company started the Culinary Whitewater Series last year in response to the growing interest in culinary travel. OARS, another adventure rafting company, goes a step further by bringing a Culinary Institute of America-trained chef on its Wilderness Gourmet trip series. 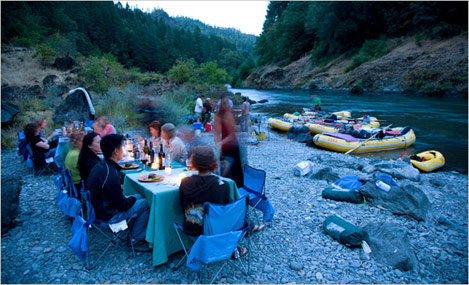 Participants get white-tablecloth cooking lessons on the banks of the Rogue River in Oregon with Bob Anderson, formerly executive chef of the Ahwahnee Hotel in Yosemite and currently owner of V Restaurant in the historic mining town of Murphys in the California Sierra foothills. Mr. Anderson is a self-proclaimed lover of the outdoors and a fan of river rafting. During his time at the Ahwahnee, he organized pack trips at Yosemite high camp. With OARS’s white-water trips, weight isn’t as much of an issue, though he still has to pack his provisions wisely. “I like to refer to it as a vintner dinner interrupted by white-water rafting,” said Mr. Anderson, whom guests call Chef Bob. He uses Dutch ovens to make braised chicken, flambées steaks in Jack Daniels sauce, and fills black Mission figs with Point Reyes blue cheese and wraps them in bacon. Other than the foodie element — after the trip, participants get monogrammed aprons and recipe books to take home — the OARS. Wilderness Gourmet itinerary, which the company has been running for four years, follows the normal routine of rafting, kayaking and hiking by day and riverside camping by night. Angela Kotsalieff, a 36-year-old lawyer and avid backpacker from Chicago, was a guest on the Rogue River trip last September. She heard about it first through word of mouth, and was drawn to the rafting challenge. She spent much of her time exploring the Class III rapids by inflatable kayak and floating through the river’s “swimming rapids,” roiling spots where participants can jump out of the boats and swim. Of course, professional camp cooks have known this for years, and some of the best have learned from LeRee Hensen, who runs Royal Tine Camp Cook School in Montana’s Rocky Mountains. The camp’s two-week sessions are geared toward aspiring backcountry guides and cooks. Students hike and camp out at the school’s 10,000-acre cattle ranch, at an elevation of 5,800 feet, and learn how to cook wild game and bake sourdough bread, making the temperature conversions that high elevations require. Royal Tine also offers four-day sessions that are designed more like outdoor cooking adventures, with lessons on wilderness-specific activities like catching and grilling local trout and preparing Dutch-oven berry cobbler on an open-fire pit. Even guide services specializing in more serious adventure travel, like the Seattle-based mountaineering company Mountain Madness, are incorporating do-it-yourself haute cuisine into their packages. The company has long provided top-notch food for all its trips, from Alaskan glacier explorations to expeditions up Kilimanjaro; this summer, however, clients who are taking mountaineering and rock-climbing courses will be cooking on their own, with direction from guides. Though Mountain Madness guides are not formally trained in backcountry food preparation, and the courses and guided trips don’t have an official cooking-class component, the company is considering tailoring its popular Mount Baker glacier climb in Washington State to customers who are particularly interested in the food aspect. “There’s always an audience for a slowed-down and more super-deluxe trip, and that always involves food,” Mr. Gunlogson said. As for those travelers who have already experienced cooking school in the great outdoors, do any of these lessons actually stick?